We sometimes think we will enjoy Christmas best by eating and drinking as much as possible. In reality no one likes feeling bloated after a meal so in the third and final post for Christmas here are my tips for making Christmas day happy and healthy. First up some tips for the cooks. The bird – For me there is nothing worse than a dry turkey. For this reason I don’t rate the idea of piercing the skin to ensure that the fat drains out during cooking. This will only save you about 40 calories anyway and to achieve that you would need to make sure that you did not eat any of the skin. It’s Christmas day and that’s a great time to treat your taste buds so why not try brining your turkey first before cooking. This basically means taking your fresh raw turkey (thoroughly defrosted if you bought it frozen) and allowing it to steep in delicious flavours like orange juice, water, cinnamon, honey and salt and any other spices that take your fancy. I know this sounds a bit unhealthy in terms of sugar and salt but you throw the brining fluid away afterwards so some of the less healthy stuff goes down the drain. If you are cooking for lots of people you will need a very clean, big , plastic, water-tight box to accommodate your turkey. If you are leaving it outside (assuming it’s cold enough) make sure the lid is firmly on and covered with something very heavy to keep hungry garden wildlife out. Let your turkey brine overnight. Dry it thoroughly and then cook it breast side down to start with. This will stop the breast drying out too much. Half way through the cooking time turn it over so that the whole thing cooks evenly. Don’t add any additional oil but baste it a little in the oil that drains out to keep it moist. You can apply the same tricks to any bird really if Turkey is not your thing. Be aware though that goose and duck are much higher in fat in the first place. Roasties – The trick is to keep the fat content down whilst still keeping them crispy and golden. Start by making sure you have the right sized potatoes. If you choose small ones or if you cut large potatoes up too small you will increase the surface area that absorbs the fat so go for something about the size of the palm of your hand. Par-boil first and then shake the pan to rough them up a bit. Put some oil in an oil mister bottle so that you can spray it on. Select oil that is high in monounsaturated fat as polyunsaturated fats produce potentially harmful chemicals when heated to high temperatures. Olive and rapeseed are good choices. Spray the oil on your potatoes. You are aiming to coat each one but not to have them swimming in fat. Half way through the cooking time turn them over and spray the other side. Before you serve them lift them onto some absorbent kitchen roll and gently press another layer over the top to lift out any excess oil. Accompaniments – all that stuffing, bread sauce, gravy and pigs in blankets really add to the fat and calorie count and can leave you feeling pretty boated. A chestnut and fruit based stuffing can have halve the calories of a sausage meat based recipe. You could try quorn sausages instead of pork sausages to keep the fat down but it’s Christmas day so if that doesn’t float your boat then use cocktail sausages rather than the full sized ones. Making your own bread sauce with skimmed or semi-skimmed milk will save about 200-300 calories. Don’t forget to have your ice cubes at the ready as mentioned in my last post. Dropping a couple into the gravy is a great way to remove excess fat as it will congeal around the ice cubes allowing you to simply lift out the cubes and the excess fat along with them. Pudding – Offer lighter options alongside your Christmas pudding. If you have been following this series you will already have stocked up on the right ingredients to rustle up some healthier choices. Getting it together for festive foodie fun. For many people of course Christmas just isn’t Christmas without Christmas Pudding. However you can still offer some healthier choices to accompany it. Make some custard with skimmed or semi-skimmed milk as an option instead of brandy butter and cream and consider having fat free Greek yogurt, half fat creme fraiche or half fat cream available too. If your job is just eating and drinking rather than cooking take a more mindful approach. You will probably enjoy the day more and eat much better. Don’t start eating and drinking too early. Christmas lunch tends to come fairly late and it’s easy to be stuffed with nibbles and canapés before we even sit down at the table. Have a good healthy breakfast like porridge or scrambled eggs with smoked salmon. This should help you stay off the nibbles so that you have more of an appetite for the meal itself. Keep well hydrated with plenty of water as it’s easy to mistake thirst for hunger. You could perhaps suggest a pre-dinner walk or family game to give yourself something else to focus on. 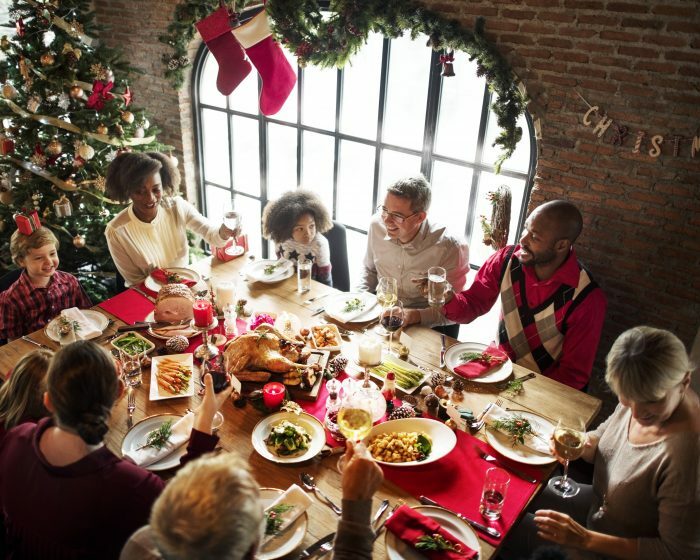 Try to stick to one pre-dinner alcoholic or high sugar drink perhaps to accompany present opening – you will not enjoy the meal if you are already sloshed or suffering from blood sugar swings! Throughout the day ask your hosts not to top up your drinks. Do this yourself and alternate alcoholic or higher sugar drinks with water or something sugar free. When you sit down to the meal itself cover half your plate with vegetables first before serving anything else this will give the meal a much better balance of flavour and make your plate really colourful and appetising. Eat slowly and savour the flavours and the ambience. Chat and share cracker jokes with the kids. Taking more time over the meal will give your stomach time to tell your brain when you are full. You want to feel full but not as stuffed as the turkey. So that’s it really other than to say a very merry Christmas to you all. Enjoy it! This entry was posted in Christmas, Christmas day and tagged Christmas, healthy cooking, healthy eating, mindful eating by Stephanie.fade. Bookmark the permalink.